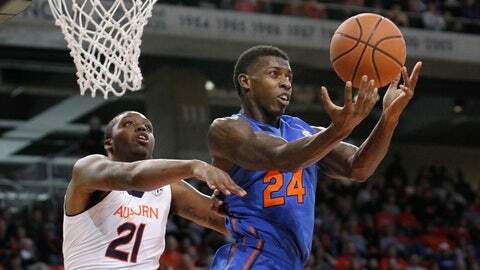 Florida senior Casey Prather returned from injury to score a game-high 21 points against an upset-minded Auburn Tigers team on Saturday. NASHVILLE, Tenn. — Two weeks into Southeastern Conference play, Florida is the only team without a league loss. The Gators keep creeping up the national rankings, too, rising to No. 6 in this week’s AP Top 25 poll. Florida has won nine straight, including Wednesday’s game against Georgia that set the program record of 25 straight home victories. But the team’s two SEC road wins — at Arkansas in overtime and tight Saturday at Auburn — show life on the road in the SEC isn’t always pleasant. It’s not as big as some league arenas, but the O’Connell Center — better known as the "O" Dome — can be the most boisterous. The Gators rewarded their crowd in Wednesday’s 72-50 win over Georgia to set the home winning streak record. After holding the Bulldogs to a season low in points, Florida leads the SEC and is 10th nationally in scoring defense (59.7). After missing two games with a bruised knee, senior forward and leading scorer Casey Prather returned to help avert an upset against Auburn, notching a game-high 21 points. Freshman guard Aaron Harrison continues to provide outside balance to the inside muscle of freshman forward Julius Randle, the SEC’s leading rebounder (10.5). Harrison is blossoming in the backcourt alongside twin brother, Andrew, scoring a season-high 26 points in the team’s 74-66 win Saturday over Tennessee after notching 16 at Arkansas. With nine freshmen, No. 14 Kentucky is the youngest team in the country. They were reminded of that in the overtime loss Tuesday at Arkansas, where the Wildcats have lost three straight. Randle had 12 points and 12 rebounds in the second half, finishing with 20 and 14, respectively, to carry the Cats down the stretch. Despite starting league play slowly with losses at Vanderbilt this past week and Georgia at home a week earlier, the Tigers still have the league’s third-best RPI (Ratings Percentage Index) at No. 55, according to NCAA.com. That trails only Florida at eighth and Kentucky at 13th. Missouri took that angst out Saturday on visiting Alabama with a lopsided 68-47 win. The Tigers held the Crimson Tide to 29.2 percent shooting and got a career-high matching 24 points from junior guard Jabari Brown. He had 22 in the team’s lackluster loss at Vanderbilt two nights earlier. The Bulldogs are two-for-two in SEC overtime games, beating Arkansas 66-61 Saturday after opening league play with an OT win at Missouri. In his 42nd career start, junior forward Marcus Thornton notched his first double-double with 11 points and a team-high 13 rebounds. The 3-1 start hasn’t com at the expense of slouches, but rather over three teams — Missouri, Alabama and Arkansas — that have NCAA tourney aspirations. When outrebounding opponents, the Bulldogs are 9-0. The 24 offensive boards against Arkansas were the team’s most since 26 against Vanderbilt in 1997. Forward Davonte Fitzgerald was named SEC Freshman of the Week after scoring a career-high 20 points in a career-most 32 minutes in Saturday’s overtime loss at Mississippi State. He shot nearly 60 percent for both games. Sophomore guard Alex Caruso picked up his 200th career assist. In the loss, junior guard Jamal Jones scored a game-high 24 points, but was ejected after getting two technical fouls with 1:07 remaining in overtime. His status for Tuesday’s game at Kentucky is uncertain. After the game, Aggies coach Billy Kennedy apologized for his team’s actions. Sophomore forward Jarnell Stokes has become a double-double machine. In the loss Saturday at Kentucky, he had 20 points and 15 rebounds for his ninth double-double of the season and 27th in his career, good enough for eighth on the program’s all-time list. The Vols outrebounded Kentucky, the league’s top rebounding team and national leader in rebounding margin, by a 39-24 edge. The Vols have held 17 of their 19 opponents to 70 points or fewer and given up only 62.6 points per game, third-best in the SEC and 27th in the country. After being suspended for the first two SEC games, senior guard Marshall Henderson, the league’s leading scorer last season, arrived with a vengeance. In wins over LSU and South Carolina, he averaged 22 points, 3.5 rebounds, two rebounds and two steals in being named SEC Player of the Week. In the second half against LSU, he had 19 points, including a crucial 3-pointer that gave the Rebels the lead for good. The charismatic Henderson also had a career-high seven assists. Behind 2.65 shot blocks per game by 6-foot-9 junior forward Aaron Jones, the Rebels lead the SEC in blocked shots (7.1). The wild overtime win over Kentucky will go down as one of the more memorable in Razorbacks history. The put-back dunk by 6-foot-6 sophomore forward Michael Qualls with 0.02 seconds remaining made national highlight reels. The Hogs took a step back, though, with Saturday’s loss at Georgia. At 83.3 points per game, the Razorbacks lead the SEC and are 14th in the nation in scoring. The Arkansas bench has had a double-figure scorer in 14 of its 16 games. The Tigers had the chance to win at Ole Miss in regulation Wednesday, but a 15-footer by junior guard Anthony Hickey at the buzzer missed. Relegated to coming off the bench, former starting senior guard Andre Stringer had a career-high 23 points, including five 3-pointers. On Saturday, the Tigers kicked off a key stretch of five home games in six outings with an 81-58 blowout of visiting Vanderbilt. Junior forward Johnny O’Bryant III had a game-high 22 points and 12 rebounds. Rivals Alabama and Mississippi State have played 192 times, the most of any Crimson Tide opponent. But with the new league scheduling format, the teams will play only once in a season for the first time since the 1963-64 campaign. Alabama made a season-high 10 3-pointers in the 80-61 win over the Bulldogs on Wednesday. With a game-high 28 points, senior guard Trevor Releford moved into 14th place in team career scoring. With 10 points in the loss at Missouri, he has 1,595 career points and has scored double figures in 18 straight games. SEC Saturdays at home suit the Bulldogs. After rallying to beat rival Ole Miss a week earlier, they pulled out an 81-72 overtime win Saturday over Texas A&M. Sophomore forward Gavin Ware scored eight of a team-high 22 points in the extra session. In the lopsided loss at Alabama, Ware had a team-high 18 points. The Bulldogs have lost four straight to Alabama and eight in a row in Tuscaloosa. Showing that its gutsy effort in a home loss to Kentucky the previous Saturday wasn’t a fluke, the Commodores knocked off Missouri on Thursday. Senior forward Rod Odom, who had been held to five points against Kentucky, scored a career-high 24 points with a career-best six 3-pointers. He also had eight rebounds, three assists and matched a career-high with four blocked shots. Having played only seven players in two previous games and a 48-hour turnaround for a road game, the Commodores ran out of gas in the blowout loss Saturday at LSU. Vanderbilt shot 35.8 percent from the field, second-worst of the season, and was outrebounded 48-24. After losing tough decisions at Tennessee and home Saturday against Florida, Tigers coach Tony Barbee proclaimed Monday a "breakthrough moment" for his team was coming soon. The Tigers have played — and lost by an average of 5.8 points — four of the league’s top six RPI teams. Down by 13 in the first half, Auburn could have tied Florida in the final minute with an additional 3-pointer. Senior guard Chris Denson, who had 18 points against the Gators, leads the SEC in scoring (19.5). The Gamecocks have also had their near misses to open league play, including the gut-wrenching 75-74 overtime loss Saturday to visiting Ole Miss. Freshman forward Sindarius Thornwell, the team’s top scorer, had 24 points and a season-high 11 rebounds, but missed an off-balance shot with 1.8 seconds remaining that could have been the game winner.